Tomatoes weighing a pound to and ounce fill the basket. 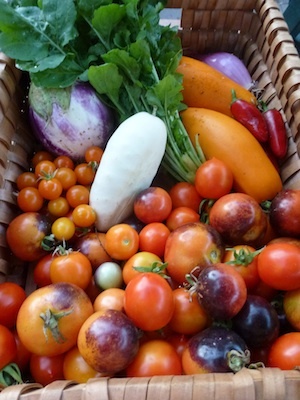 Makings for the last garden fresh ratatouille and gazpacho are in this basket. October 2017 tomato, pepper and eggplant harvest is the biggest all year. Everyday from now on is borrowed time. Green tomatoes just a few days from ripening can be picked just before that first frost warning. The dehydrator is filled with tomatoes. Some will be made into tomato powder. It will thicken and enrich soups and sauces. Plus, this dehydrated bounty takes up very little room. A good thing since the pantry and freezer are loaded. All the tomatoes and peppers that the family will eat from now till next summer, are canned, dried or frozen. I bought some of the produce at the farmers market, including onions, corn and green beans. I know where this food came from and how it is grown. True homesteading isn’t possible in our case. But eating locally grown, tomatoes all year is possible. That includes fresh tomatoes for 5 or 6 months, plus, all the salsa, pasta sauce, canned tomatoes, tomato sauce, and tomato soup we will eat for one year. The canned, dried or frozen tomatoes will go into, chili, soups, stew, enchiladas, and casseroles. It’s comforting to know that we won’t have to buy any tasteless mass market tomatoes or imported peppers all year. Tomato soup made fresh from scratch. Whole paste tomatoes are frozen. On a cold snowy day the full bag will simmer on the stove top into something “tomatoey”. Maybe a dark, thick tomato sauce simmered low and slow, or vegetable soup. These fresh picked heirloom tomatoes will be savored fresh as insalata Caprese, ratatouille, gazpacho and in salads. 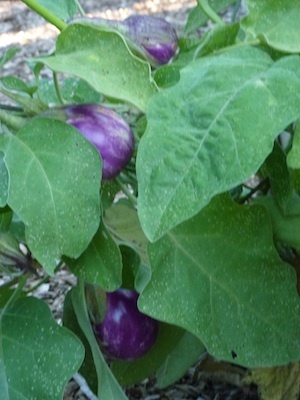 There are a few more tomatoes, peppers, eggplant. The only other produce left in the garden are herbs and sweet potatoes. Butternut squash is curing on the covered porch. Eggplants, sweet peppers, Anaheim and poblano green chile peppers, giant heirloom tomatoes, cherry tomatoes, sweet onions. 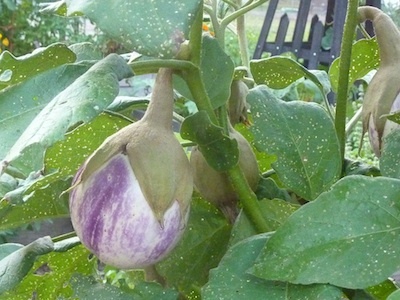 Finally, the eggplants are plentiful. That completes the ingredient list for ratatouille. Ratatouille is a showcase of summer garden in one main dish. By the time all the ingredients are assembled, the dish is big enough to ensure leftovers. I believe the dish is better the next day. This vegetable casserole is great served with rice. 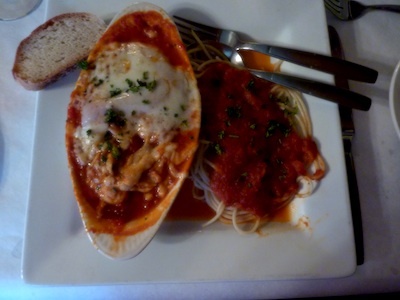 I make a slightly under cooked version of this and freeze it. One snowy winter day, I’ll enjoy my homegrown taste of summer. 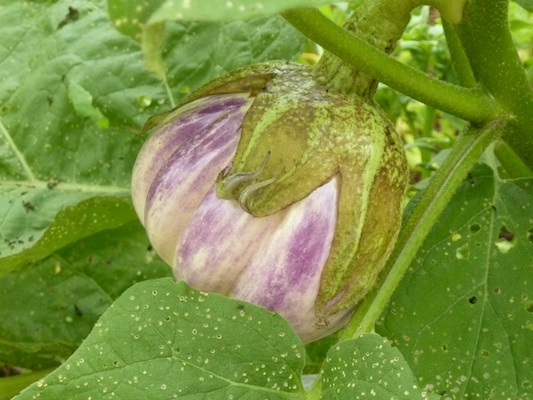 Eggplants* grown in a container on the deck. I love cherry tomatoes, they start producing early and just keep on growing till first frost. With the full size tomatoes coming on strong, cherry tomatoes are good for dehydrating. Mix colors and shapes of cherry tomatoes for a mix of sweet and tart tomato flavors. Easy, fast, tomato tart suitable for serving at any meal. The tart is a lighter version of tomato pie. Tomato Tarte Tatin is a simple summer-only treat. This is a great way to use up a lot of cherry tomatoes. 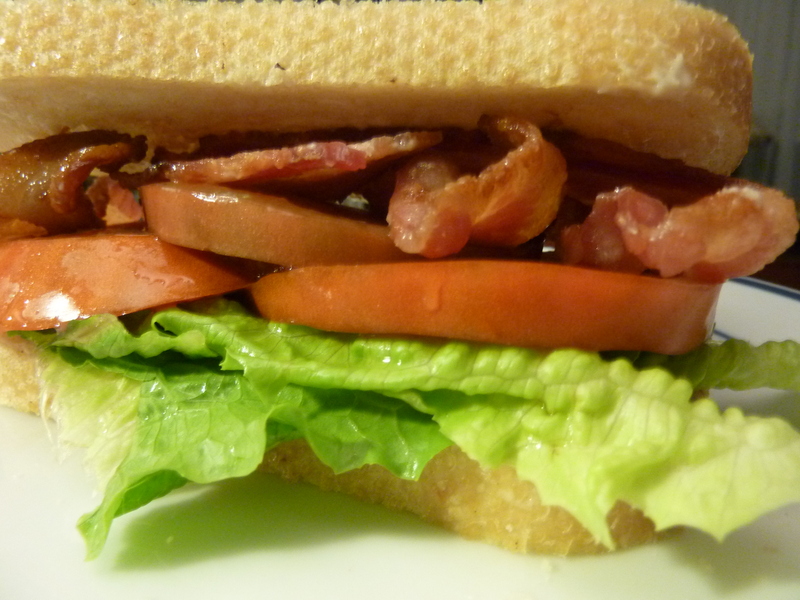 I used a mix of red and yellow cherry and pear tomatoes. Caramelize a small onion, and fill the skillet of onions with a single layer of little tomatoes. Cover with a layer of puff pastry. Bake tart until crust is puffed and golden, about 30 minutes. Cool tart in skillet 10 minutes. Loosen pastry around the outside of the skillet. Place large platter over skillet. Hold skillet and platter firmly together and invert, allowing tart to settle onto platter. 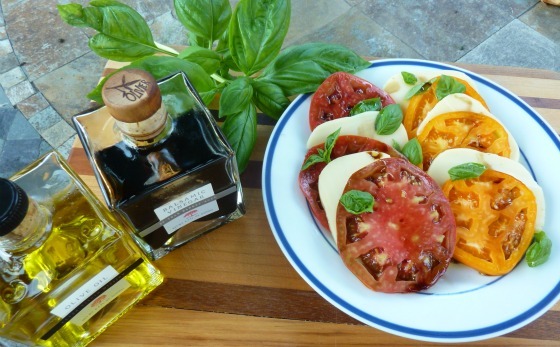 Garnish with fresh chopped basil and Parmesan. 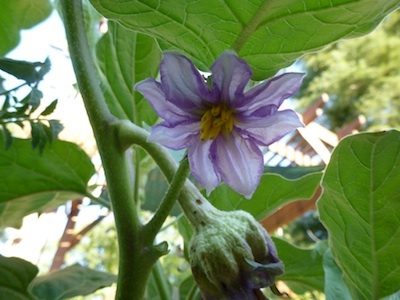 * Container Eggplant Little Prince grown from Renee’s Garden Seed. Ratatouille makings. Tomato, eggplant, peppers, squash. An old fashioned vegetable dish, ratatouille is a combination of all the things I grow in my garden. Julia’s Ratatouille is garden gold in your freezer. Once you master a great dish like ratatouille, you become confident enough to try variations. I can hear Julia Child talking about this dish. The full name of the stewed vegetable dish is Ratatouille Niçoise. Her recipe is the classic, start there and then adapt it to your taste. 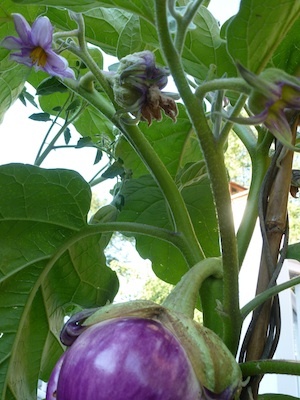 It’s time to make ratatouille when there is an abundance of eggplant in the garden. Usually the last main crop vegetable to produce in my vegetable patch, eggplant is the star of my version. If your don’t like eggplant then leave it out of the recipe. This dish very quickly uses up the seasonal glut of produce that happens in August. By now, I have all the zucchini, tomatoes and eggplant that I can eat. I grow every vegetable that goes into this simple French peasant dish. This dish is a celebration of my garden bounty. 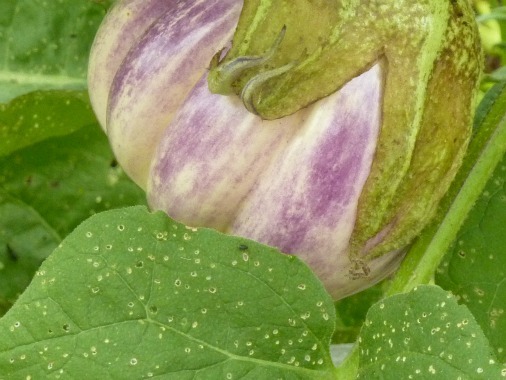 It’s a thanksgiving meal at the peak of the growing season. Make a double batch because this stew reheats well for the next day or hoard it for your lunches. Make this dish and freeze it. This winter, when the snow is falling, a reheated ratatouille meal will taste like a garden party in your mouth. Reading seed catalogs while eating a steamy bowl of home-grown and homemade ratatouille is a ritual guaranteed to cure cabin fever. 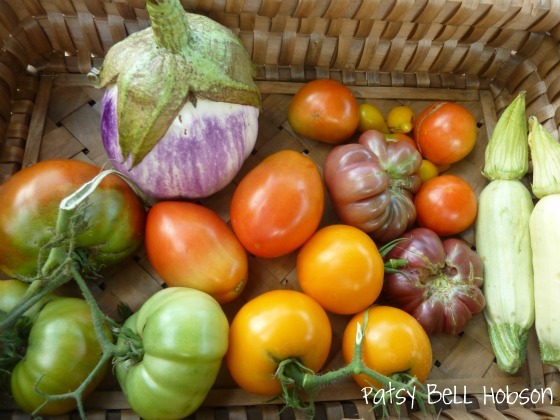 That vegetable casserole inspires my wintertime seed order. Julia’s Ratatouille is garden gold in your freezer, A true example of your garden prowess.This versital vegetable casserole can be a featured entre, a side dish, lunch for many cold winter days. I freeze it in portions for one or two.Serve it over noodles or rice for a heartier meal. Add a slice of crusty bread. Make plans to go to Paris some day. This arugula, is a perfect green to combine with lettuce. Tonights salad included the arugula, cucumber, tomatoes, red onion. I make my own salad dressing. Usually a lemon and olive oil is the start of a good homemade dressing. TAM is Texas A & M jalapeno pepper. Less heat but all the distinct flavor of jalapeno. (The little red peppers on the right.) I’ll roast them, then freeze. That way they will be handy to add to salsa and chili. Posted in Harvest Basket, My Gardens, My Homeplace, Oh Grow Up!